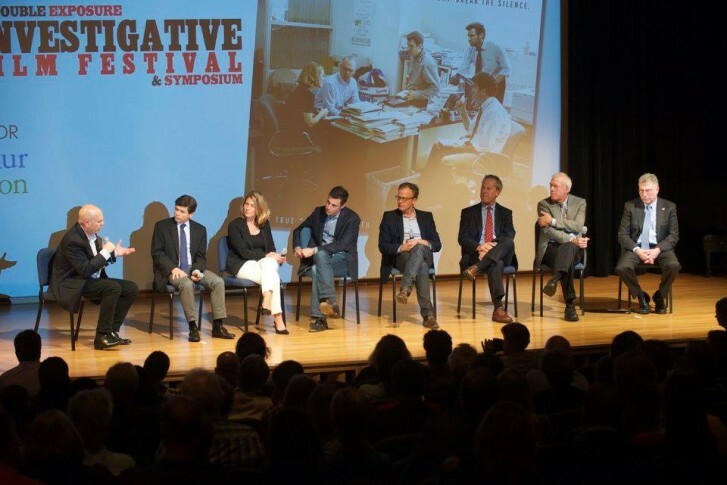 A year after hitting a home run with "Spotlight," the Investigative Film Fest returns to the National Portrait Gallery. Now, the second annual Double Exposure: Investigative Film Festival returns to the National Portrait Gallery on Oct. 6-8, promising another powerful slate that just might contain future award winners. The documentary exposes the hard truth that an elephant is killed for its tusks every 15 minutes. Over the past five years, 15,000 have been killed, as a single kilogram of ivory can sell for $3,000. Co-directors Kief Davidson and Richard Ladkani will be on hand Thursday night, as well as WildLeaks founder Andrea Crosta and Chinese freelance journalist Hongxiang Huang, both featured in the film. That same investigative spirit oozes from Friday’s slate, starting with “A Leak in Paradise,” chronicling Rudolph Elmer, an ex-banker turned whistleblower revealing hidden accounts in the Cayman Islands. You can hear from Elmer in person on Friday night, as the whistleblower will attend the screening alongside director David Leloup and New York Times National Correspondent Eric Lipton. Friday’s slate continues with the documentary “All Governments Lie,” a tribute to legendary investigative reporter I.F. Stone, who exposed government corruption from the 1950s-1970s. The film is based on the book by Myra MacPherson, who will attend with director Fred Peabody, producer Peter Raymont, journalist Dan Froomkin, and Stone’s nephew and journalist Peter Stone. Friday’s impressive slate concludes with the financial docu-thriller “Betting on Zero.” It follows hedge-fund manager Bill Ackman’s high-profile crusade to bring down Herbalife, the nutritional supplement company whose entire business model, he claims, is an illegal pyramid scheme. Ackman will be at the screening, alongside director Ted Braun, human rights activist Julie Contreras, and NPR’s Ricardo Sandoval Palos. Herbalife was invited to share its side, but opted not to come. If you think that’s already a powerful lineup of investigative movies, that’s just the first two days! Saturday brings an equally intriguing slate, starting with Gianfranco Rosi’s “Fire at Sea,” which won the Golden Bear at the Berlin International Film Festival. It follows an Italian island 70 miles from Tunisia called Lampedusa, which has become a primary stop for hundreds of thousands of refugees fleeing violence, poverty and persecution throughout Africa and the Middle East en route to Europe. On hand at Saturday’s screening will be Ron Nixon, Washington Correspondent for The New York Times, and Kathleen Newland, co-founder and senior fellow with the Migration Policy Institute. After all of those heavy subjects, pour yourself a glass of “Sour Grapes,” a much lighter documentary tracking a quirky 20-something counterfeiter who mixes California reds with off-year vintages to sell millions of dollars worth of fraudulent “fine wines” to dupe wealthy boozers at $20,000 a bottle. On hand will be wine expert Maureen Downey and Washington Post food critic Manuel Roig-Franzia. “You’ll want popcorn for this film,” Schemo said, laughing. While the subject of “Sour Grapes” is unable to attend the festival due to his incarceration, a different Saturday documentary takes a very serious look at criminal justice. “Solitary” explores Red Onion State Prison in southern Virginia, one of the more than 40 “supermax” U.S. prisons holding 100,000 prisoners in solitary confinement, a practice that’s deemed a form of torture in much of the world. The festival concludes with the closing night film “Abacus: Small Enough to Jail,” which follows the only — we repeat, only — bank that was indicted as a result of Wall Street’s 2008 financial collapse. It’s the latest documentary by Oscar-nominated filmmaker Steve James (“Hoop Dreams,” “Life Itself”), who will be on hand alongside “Frontline” producer James Jacoby, investigative journalists David Lindorff and Ti-Hua Chang, and former prosecutor Vera Sung, a member of the subject family. Whether you’re a journalist or filmmaker, “Double Exposure” brings two vital lenses together, giving twice the investigation, twice the scrutiny and twice the artistry in bringing important truths to light. Is there another “Spotlight” in our midst this year?